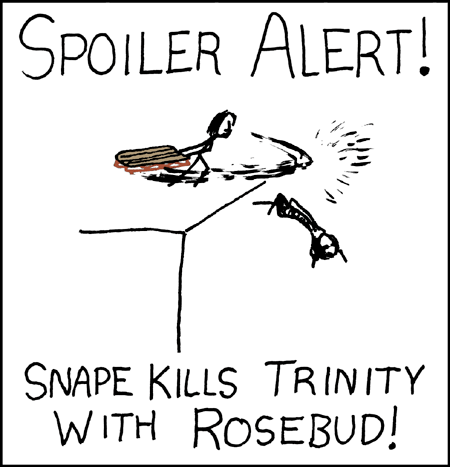 During the lead up to Inception‘s release this summer, the question of what counts as spoilers became a hot topic. So how much should filmmakers share with prospective audiences without ruining the filmgoing experience? “If you love being scared, this could be the night of your life,” narrates the Trailer Voice Guy. Except to scare someone you have to do something the audience isn’t expecting…and the trailer laid the whole thing out. What it does do however is short circuit the possibility of a full “WOW!” moment by revealing some of its best special effects work. Sure, the advertising agency is hired to make a trailer to attract audiences, so they include the best parts – but now those parts have been dulled. You’re waiting for them to happen when you go see the film, instead of being surprised by them. Even film reviewers can be a part of the conundrum. Reviews from The New York Times and Roger Ebert regularly include a complete rundown of the film’s plot points, stopping just shy of giving the whole thing away. I myself felt the impulse to follow this line because that’s how I had seen it done. In reality, all you need is to set the audience up to decide if they are going to watch or pass. If you describe anything beyond the first 15-20 minutes, you’re spoiling any surprise. Which finally gets us to the issue of dramatic twists. If you hint at a twist in a film, you’ve undone any of the power of a twist ending. This of course is problematic because the twist might be genius, but if you tell people about it then it’s not as interesting. There has been at least one film I reviewed this year that had a twist in the first 20 minutes that completely floored me. When I looked at other reviews, or even a Netflix synopsis, everyone gave it away! With the power of the internet there is a flood of information available for film fans. Set photos, early script drafts, trailers, all of these things are accessible for our perusal and they are good ways of promoting a film. But ultimately they don’t provide any extra satisfaction when we see the final product and if you consume every minute detail about the production before its release, you’re doing yourself a disservice. Wait before you gorge yourself on info (I will be avoiding the trailer for The Dark Knight Rises like the plague when it appears). The worst case scenario is that we spoil our dinner, so to speak. By snacking on all these bits of info, we lose some of the cinematic experience – going into a dark room in the hopes of seeing something awe inspiring, new, refreshing. This entry was posted in Articles and tagged Film Critics, Film Experience, Fright Night, Inception, Spoiler Alert, Trailers, Twist. Bookmark the permalink. I agree completely. If I don’t know much about a film and haven’t had someone whose opinion in movies I feel matches my own, I will look up a trailer. For any film I already plan on watching or which a friend has recommended, I’m sure to avoid them, though. They feel like unfortunate necessary evils. Perhaps after the singularity, our robot overlords will be able to simply accurately advise us on which films we will find either (a) most entertaining or (b) most fulfilling and thought provoking. Until then, people like you should keep up the good work trying to balance that line between too much and not enough info!